Bangkok is a wonderful, vibrant, and all-around different city than anything you've ever experienced. 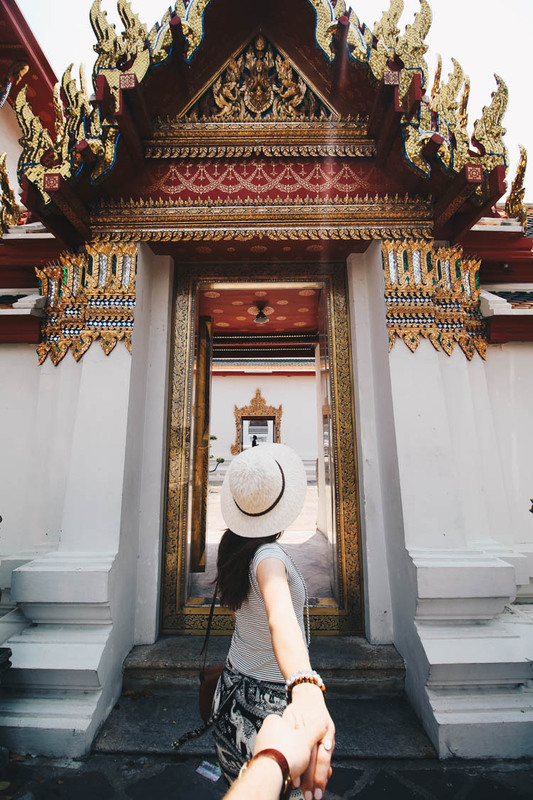 Being the hub of entry to Thailand, most travellers pass through this metropolis on their way to their chosen destinations, while other (like myself) discover the destination in Bangkok itself. Some (like my mother's old friend whom I finally met on this trip) choose to never leave at all. The wonders of Bangkok either delight or discourage, and you are either going to love or hate this city. I for one, absolutely adore it. And here are a few reasons why. When you land in Bangkok, you have likely been on a long flight with one or more layovers and possibly even long delays. This might make you a little delirious in figuring out the transit system and lugging your bags with you, so instead opt for a taxi – just be sure the taxi driver turns on the meter when you get in. The taxi system at BKK airport are regulated, so you simply line up, take a number, and meet your taxi driver in the corresponding stall. Expect to pay tolls when you take your taxi from BKK airport, this is a separate charge than the cab price itself, but altogether should be around 500-600 BAHT (about $21 CAD). To make things simple, have smaller bills on hand when you arrive in Bangkok. The drivers in Bangkok (and Thailand altogether) are pretty sporadic. Don't be alarmed – driving in-between two lanes and zig-zagging all over the place is just another part of the unique Thai culture! PS. Check Expedia.ca for the best prices for flying into either BKK or DMK airport in Bangkok. In order to get the very most out of your first trip to Bangkok, you want to ensure you are staying at the right hotel. If you aren't set up with the right place, in a convenient area, your stay may not be as wonderful as my first experience in Bangkok, during which we opted to stay at the wonderful Shangri-La Bangkok. My favourites of this luxury hotel: We felt we got an authentic experience from the staff, where we quickly picked up on the mannerisms of the Thai culture and got a taste (quite literally) for the Thai food. The pool at this hotel was incredible, which really helped in cooling off after a very hot and humid day exploring. The breakfasts here were magnificent, literally catering to every culture imaginable, and I really appreciated the endless complimentary stock of free drinking water. The location was also pretty incredible, located right on the river just a few metro stops from the city center, allowing us a peaceful escape with sunrise and sunset views. *If you're interested in booking the best, most comfortable hotel at an affordable rate, I recommend checking Expedia.ca. Longtail boats are one of the beauties of the visiting Thailand, and Bangkok is no exception, with the river that connects most areas and tourist attractions. We discovered a pier right near our hotel, and took a longtail boat to our chosen destinations closer to the city center. I'd recommend taking a longtail boat over a taxi or tuk tuk whenever you can! It's fun, affordable, and gives you a nice breeze where it's surely needed. *Please, do not rent a scooter in Bangkok! It's just not safe – wait until you are in a quieter island zone. The Grand Palace is a beautiful place situated just off the river, where we first took our longtail boat ride on day 1 in Bangkok. The entrance to the grounds is free, so walk in and enjoy some photos and cruising about amongst the other tourists. We found it interesting at the number of locals still arriving to The Grand Palace dressed in all black to pay respects and mourn the loss of their King. Once we reached the entrance, though, we found the 500 Baht price a little too high, so went down the road to Wat Pho instead. Wat Pho was so incredibly beautiful, and well worth the small 100 Baht fee to gain entry. Here you find so much beautiful, authentic Thai architecture and golden sculptures of Buddha – you immediately feel at peace. I really appreciated all of the wonderful photo opps, and definitely the free water (given out near the sleeping Buddha) as I started to get some minor heat exhaustion. NOTE: When you visit the temples you MUST cover your legs and shoulders. Ladies, the best thing to do is to pick up a cheap sarong or skirt from a market when you arrive in Bangkok, and just carry it with you to put on when needed. Men, just make sure you are wearing pants and t-shirts. Get the best 360 degree view of Bangkok from the top of Centara Grand hotel, at the champagne bar or the restaurant just one floor below it. 50 some-odd floors up in the sky, you'll realize what a metropolis city Bangkok truly is. Food in Bangkok is absolutely to die for, and you must try all of it, from upscale restaurants to down-to-earth street vendors. We enjoyed a wonderful Thai market experience at our hotel, Shangri-La, which they hold every Thursday evening. Here, you will enjoy a culinary experience with the most authentic, traditional Thai dishes, as well as many local vendors who bring their goods for shopping. The mango and sticky rice (dessert) was my favourite! Get all of the details for the Thursday Night Market at Shangri-La here. We got an interesting tip from a Bangkok local of the past 30 some-odd years, an old friend of my mom's from the 80's, which we otherwise would never have thought of: mall food courts. After turning an eyebrow up at what we know to be foodcourt food, we opted to give it a try, and took the metro to Siam Center, where we found a very upscale looking foodcourt named the "Food Republic." Here, you can get an authentic Thai meal for around 50 Baht (2 bucks!) or opt for something a little fancier. We ended up at a Japanese Restaurant where we proceeded to eat the BEST SUSHI of our lives. We ran up a bill of about $37 CAD, but hey, so worth it! We ended up at a huge market north of Bangkok on our last day, which happened to be a Saturday when this weekend market was on. Here, you will find about 8 thousand vendors selling all kinds of clothing and goods, as well as some incredibly tasty street food! If you want to visit, take the BTS to Mo Chit station – it's about a 20 minute commute from the city center. There you have it, traveller! I hope you will enjoy Bangkok as much as I did. Other things you may look at (which I didn't get the chance to) is a floating market (requires half a day) and a Muay Thai Boxing match.